The Google Assistant is smart, and it’s only getting smarter with every update. It can do a lot for you, from setting alarms to rolling a magic 8 ball to even controlling your home through devices like Nest or Philips Hue. While it can do all of these things for you, sometimes the functionality it lacks can surprise users. It’s made even stranger because Google seems to add features that some would deem important much later than others, like the ability to set your own audio to play for an alarm set by the Assistant. Only recently did Google silently add support for searching for YouTube videos on a Chromecast through the Google Assistant, which again may seem like something that should have been added a long time ago. To activate the feature, simply ask the virtual assistant on any of your enabled devices to display a list of videos of a certain type on your Chromecast-enabled TV. 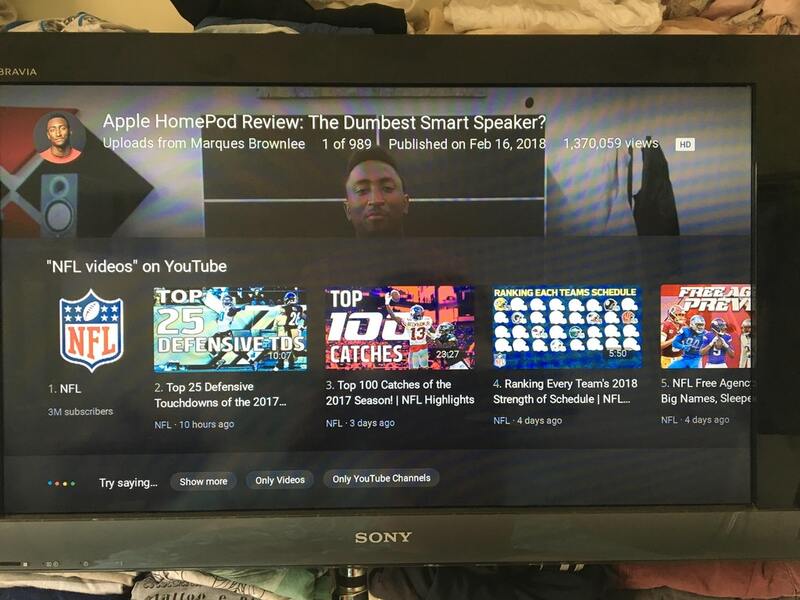 If your TV were named “Bedroom TV”, simply say “Hey Google, list x videos on YouTube on my bedroom TV” where x is any content you can imagine that would be on YouTube. You could also say “Ok Google, show me x videos from YouTube on my bedroom TV.” It’s simple to use, and can enhance your home cinema system substantially. A video from /u/otaviosk showing the new feature in action on their Chromecast enabled TV. It appears that the feature is slowly being rolled out, as multiple users have reported not being able to use the feature. Our Editor, Mishaal Rahman, can confirm that it works, though. It is unknown if it will be a regional exclusive, or later tied to a user’s account which has a YouTube Red subscription or not. There appears to be no way to force-enable the feature, and there appear to be some limitations. For one, you can’t play videos from your subscriptions, and secondly, it seems that it won’t be available for the first generation Chromecast. You can ask it to list videos from an individual YouTuber, however. Simply saying “Hey Google, list XDADeveloper’s videos on YouTube” for example will net you a stream of the latest videos available on our YouTube channel. Give it a try, and let us know if it works on your device!